Nik Sharma's highly anticipated book Season has arrived, and it's outstanding. Culinary greats like Nigella Lawson, Yotem Ottolenghi, and Diane Henry have been singing its praises, and Season lives up to the buzz. Filled with 100 inspired recipes and stunning photography, the book follows Sharma's culinary perspective from India to California, with stops in the South along the way. Through Season, Sharma weaves the flavors of his story into the fabric of a new American cookbook. Sharma is the award-winning blogger behind A Brown Table and writer of a weekly column for the San Francisco Chronicle. He's a magical alchemist with an ability to make the most of each ingredient, turning flavor and spice into gold. Take, for instance, the incredibly delicious turkey-mushroom hand pies. The filling, a mix of garlic and chilies, turkey, and mushrooms, is finished off with a splash of reduced vinegar, adding just the right amount of acid to make a simple hand pie otherworldly. A fall dinner party is the perfect opportunity to highlight Season's innovative and interesting recipes. Chipotle-garam masala olives, and ginger and tamarind refresher to start, followed by cocoa-spiced bean and lentil soup, and Margarita naan pizza for the mains, followed by apple masala chai cake or sweet potato bebinca, Sharma's grandmother's spin on Goan egg and milk pudding, for dessert. Unexpected flavors surprise throughout the book in a thoughtful way with careful instructions. The "Staples" chapter demystifies potentially unfamiliar ingredients such as jaggery, an unrefined form of sugar, and ghee, clarified butter. It offers helpful guidance on how to prepare tamarind and spice blends. Though Season is not a traditional Indian cookbook, it is sprinkled throughout with the spices and soul of the author's homeland. Sharma has an artist's hand with food and photography. The art historian in me was immediately drawn to the chiaroscuro qualities of the photographs with their play of light and dark. They are some of the most beautiful images I've seen in a cookbook. Coupled with stellar food, Season is a book that fills the senses. These hand pies were my favorite snack in high school, and even though I've moved across oceans and continents, they still thrill me. During high school, I'd stop by the local Goan bakery every week to grab one or two of these delicious spiced ground meat "patties." When I couldn't find an equivalent in America, I set about creating my own. To assemble the hand pies, line two baking sheets with parchment paper. 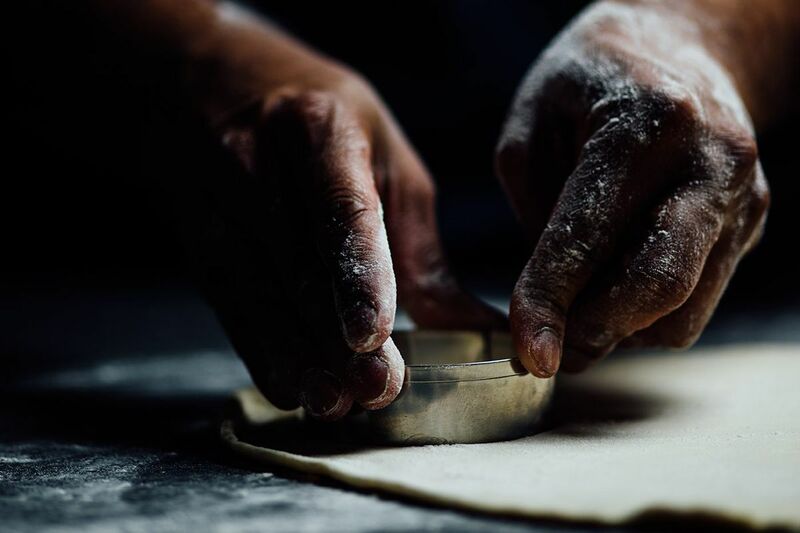 Working with one sheet of pastry at a time (keep the other refrigerated), roll out the puff pastry on a clean and lightly floured surface. Using a 4-inch round cookie or biscuit cutter, cut out sixteen pastry circles. Place 2 tbsp. of the cooled turkey-mushroom mixture in the center of each round. Brush the edges of the pastry with a little water and place a second piece of pastry on top, pressing the edges together gently to seal. Using the prongs of a fork, crimp the edges. Carefully transfer the filled pastries to the prepared baking sheet. Refrigerate while repeating with the second puff pastry sheet. Once all pies are formed, freeze for 10 to 12 minutes. Preheat the oven to 350°F. In a small bowl, whisk together the egg and 1 tbsp. water. Brush the top of each pie with egg wash and sprinkle a pinch of nigella seeds on top. Refrigerate for 10 minutes. Bake the pies for 12 to 15 minutes, rotating the sheet halfway through baking, until they turn golden brown. Serve hot or warm.